Why did the water in the kettle boil? Because it got hot! WUWT has been really, really quiet since the fiasco with Tim Ball's latest conspiracy blurb and the response. Usually there are anything from three to eight articles a day. There have only been three articles in the past three days, including the fiasco article. There's one by Willis Eschenbach about a buoy and temperatures. It's too trivial to archive. There's another by "Bob Tisdale", about an article on Ed Hawkins' blog by Geert Jan van Oldenborgh. "Bob's" article isn't worth reading, either, though if you want to do so it's archived here. The article on Ed Hawkin's blog is worth reading. Dr. van Oldenborgh's article is explaining how there is more energy being stored on earth than is coming in from the sun. He writes how most of it is being accumulated in the ocean. As we can see, yes, the oceans to depths of 2000 meters (about 1.25 miles) have warmed according to the NODC data, but note the warming rate. It is only +0.03 deg C/decade. That’s read 3 one-hundredths of a deg C per decade, which is a very tiny warming rate. It would be even tinier if we had data for the oceans from the surface to the ocean floor. You might recall that scientists have figured out that the oceans in the southern hemisphere have been warming faster - which doesn't show in the above. Global surface temperatures in 2014 are very likely to be at record high levels in 2014. We are going to see that framed in many ways in months to come. However, we understand the reason for those record high levels to be the unusual warming of the eastern North Pacific. That's a bit like claiming that the water in the kettle boiled because it got hotter. It didn't boil because you put it on the stove and lit the gas. Thank you Bob. Informative as always. The essential message from this post is (quite correctly) that we have absolutely nothing to worry about, the ocean ‘warming’ is virtually undetectable, and the models have been useless. They’ll be annoyed over at Hot Whopper. It'd be nice to think that the quiet on WUWT is due to some feelings of shame over the awful Tim Ball post, but unfortunately it's probably just because of the Thanksgiving holiday in the US, which was Thursday and spreads across the whole weekend. Most everything comes to a stop, except for retail, because of the traditional start to the Christmas shopping season on "Black Friday", the day after Thanksgiving. I believe it's so named because retailers suddenly find their balance sheets to be in the black because of the crush of business, but it's also viewed with a certain amount of dread by the more rational and less materialistic among us -- there are always grotesque scenes somewhere of people camping out for days waiting for the doors to open, trampling others to get at the fantastic bargains, and so on. What is the science behind scum gathering on the surface of a pond? It seems apposite to me. Not sure why it seems so outrageous that someone would question the theory that we are warming at a record pace when it is well documented that the surface has stopped or virtually stopped warming. And I know that all the surface heat is now in the oceans. ..... but why did the surface stop warming? I tend to be a bit of a skeptic..... wondering how the non skeptics bridge that gap. Did I say something along those lines? (The non-skeptics- ie fake sceptics - I come across aren't interested in finding out about science and aren't interested in bridging any gaps in their knowledge.) I imagine your question is about how the land and sea surface sometimes warms rapidly and sometimes not so rapidly and sometimes cools a bit as time goes by. What happens on earth is that oceans and air move a lot - there are currents and there is wind and there is rain and storms and evaporation and condensation. There are large changes in the system like ENSO and others, which shift energy around the earth system. Like a breeze that can cool even on a hot summer's day. That's the simple version. Read the article I pointed to. It's rather good. Re your question - why did the surface stop warming - well it depends on your time frame whether that's true or not. From day to night it's because of the sun. In the weekly/monthly time frame for people in the Northern Hemisphere, it's to do with the way the earth faces the sun over the year (the NH is approaching winter). For the earth as a whole, the last three months have been the hottest August, September and October in the record - but not every month or year is the hottest in the record. There's not been a hottest year on record since 2010. There's not been a hotter decade than the 2001 - 2010 decade for a very, very long time. It's also a very, very long time since there's been a hotter 30 year period than the last 30 years. The next 30 years will almost certainly be hotter still, and the next. If you are asking why the surface hasn't heated up as quickly these past few years as it has in some other periods, that's because proportionally more heat has gone into the ocean than into the atmosphere and land surface. I'm not sure it was me who said something about it being "outrageous" that someone would query anything. That's what scientists do every day. However, if I did and if it was in relation to questioning whether the greenhouse effect is real, then here's one response to your comment. If the "someone" is pretending to be an expert on things climate then yes, that's definitely outrageous. They are a fake expert or deliberately out to deceive readers. If the "someone" is pretending to be a climate pseudo-scientist who posts on denier blogs, the non-skeptic readers deserve what they get, because by now they know they are just reading denier rubbish to soothe their troubled minds. BTW some 3 pack-a-day tobacco smokers don't have emphysema, either - yet. Sou.... when you say the land stopped warming because proportionally more heat went to the atmosphere and ocean than land..... are you suggesting that starting in 98.... or 2005 we jumped from the oceans absorbing 90% of the heat.... to 99.9% of the heat? I don't recall saying that the land stopped warming. Can you point to where you think I said that? Where I live the land hasn't stopped warming. Last year was the hottest on record on this land. This spring was the hottest spring on record for the land down under. Globally Sou. Everyone accepts that the land temperatures have been virtually stable (although high) for 9 years..... 18 years.... depending on who you talk to and which global measure you use. So when you said "you" you meant "everyone", not me. Thanks for the fix. Physical climatology is a holistic description of the Earth climate system. It is incorrect to use short-term variability in land surface temperature (or SSTs) as an argument against the physics of planetary energy imbalance. You have to include OHC and short-term variability in the rate of ocean heat uptake. Not everybody accepts that land temperatures have been visrtually stable for 9 to 18 years - see the Oldenborgh article in climate-lab-book linked in the 3rd para above. You may be confusing "land" with "surface"; surface doesn't work anyway, you have to go to pretty poor Lower Troposphere temperatures to find any comfort these days. And that without an El Nino. Makes you think, doesn't it? The global warming deniers are running out of temperature datasets to find zero trend lines in. I think RSS is the only one left. "The global warming deniers are running out of temperature datasets to find zero trend lines in. I think RSS is the only one left." Don't worry. 2005 is the new 1998. Hopping from El Nino to El Nino as new start year for the cherry picking of the "downtrend" in the escalator. I believe there were only a couple of articles in the last 3 days because of the U.S. Thanksgiving weekend. Bob Tisdale: "As we can see, yes, the oceans to depths of 2000 meters ... have warmed ... but note the warming rate. It is only +0.03 deg C/decade." WUWT oceanographer Tisdale has discovered that sea level rise will continue for thousands of years after stabilizing the atmospheric temperature. The ocean will keep on warming and expanding until also the ocean has warmed as much as the atmosphere. It is a very interesting article by Geert. Would you mind adding Ed Hawkin's blog to your blog roll? Done. I don't know why I overlooked that one. I really like Ed Hawkin's blog. I never said the oceans cool the world. Do you know what feedback is? Bob Tisdale has written another article claiming HotWhopper comments as his inspiration. It's a little bizarre. He claims the ocean heating is insignificant, yet he claims in a previous article "However, we understand the reason for those record high levels to be the unusual warming of the eastern North Pacific." Now I don't know if his statement is true or not. And when they say "unusually warm" they would mean unusually warm for that part of the ocean. It begs the question doesn't it - the "unusual warming" has to come from somewhere. If it was just the moving of heat from one part of the ocean to another you would expect a balancing cooling elsewhere net average result zero. I think his attempt at a straw man is this. +0.03 deg C/decade may not sound like much, but it is not going to be spread uniformally. It's an average so some parts of the ocean are going to warm more than this. I would not be surprised if this explains a lot of the record sea surface temperature observations. Otherwise, how can he explain where the extra heat is coming from? It seems fanciful to say the heat has been lurking away somewhere and has only just now coincidentally decided to come to the surface to fool all those global warming alarmists. Silly me. I usually don't bother reading articles from someone whom I consider to be dishonest. In my experience much brain power is wasted on something that just turns out to be a simple "shell game" and all I have accomplished it to figure out which shell the pea is hidden under. - treating satellite troposphere temperatures as if they are surface temperatures (they are not). - contradicts himself in his own article by saying the below 2000 metre ocean has shown no warming, yet calculating a positive trend for it! Bob's nuts with his "That’s read 3 one-hundredths of a deg C per decade, which is a very tiny warming rate. It would be even tinier if we had data for the oceans from the surface to the ocean floor." Using the full NCDC ocean dataset and fitting a quadratic (R^2 = 0.78) shows the current SST warming to be ~0.12 degrees C/decade (all 3 coefficients significant at the 95% confidence interval). So just a factor of 4 misrepresentation. Yes it dawned on me the particular pea he was trying to hide under the shell this time was the fact the ocean heat content is unevenly distributed. He then attempted to distract by creating a straw man out of the fact the average rate of temp increase for the whole ocean water column is insignificant on human timescales. I wonder if Bob Tisdale got any "inspiration" from this recent article? It is a good article BTW. The title if nothing else, Harry. See my latest article. You are mistaken, Anonymous. 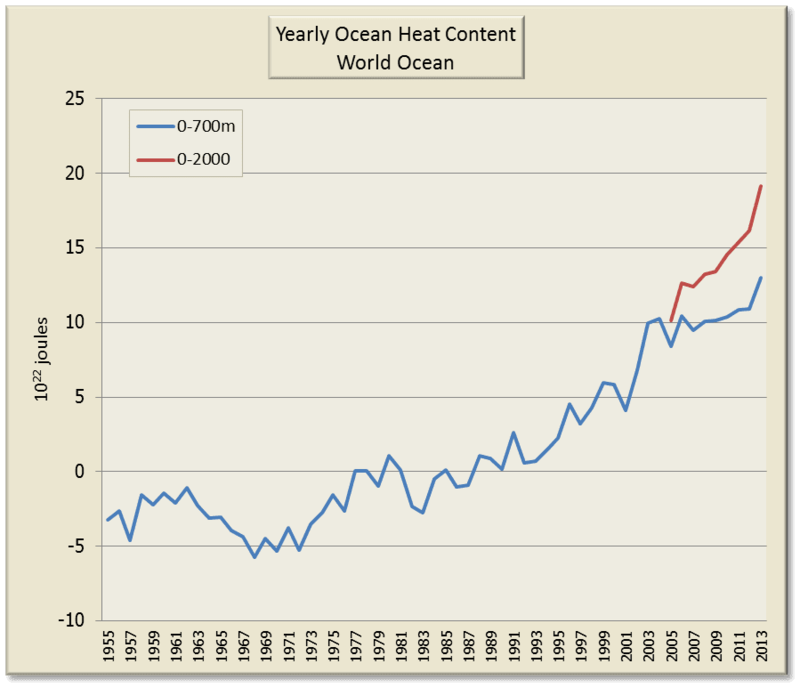 The oceans are warming very quickly, not slowly. You also appear to be confusing ocean warming with surface warming. TCR is used for surface temperature not ocean heat changes. You are partly correct about the oceans absorbing more relative to the surface. When that stops happening (eg during an El Nino) then the surface will heat up a lot more. That's partly why surface temperatures have been hitting new records this past three months. Not an El Nino, but close to. You ought to know by now that "it" is not warming slowly. We are on track to be warming ten times faster than has happened in the last 65 million years. In fact it's the pace of change that is what scientists and others are concerned about. If it were only warming at, say, 0.1 degrees every thousand years then life on earth would probably have time to evolve and adapt. Warming at one or two or more degrees in less than a century is going to make adaptation by evolution impossible. Most species just don't evolve that quickly. I don't know where you got your 0.03 degrees a decade from, either. To my way of thinking, it makes not a lot of sense to try to use temperature for the oceans because the heat gets dispersed at depth. It's even getting warmer below 700 m deep these days, which is quite phenomenal when you stop and think about it. Total heat content is a better measure IMO. And even then you need to know where in the ocean it is heating up and to what depth etc. The global warming rate in the uppermost 100 meters of the oceans has been higher than 0.03 K/decade. The warming in the uppermost 2000 meters has been accelerating in recent decades. This gives an indication where the planet is heading. You also have to keep in mind that the heat capacity of the about uppermost 3.5 meters of the ocean water body equals the heat capacity of the total mass of the atmosphere. BTW: Interesting are the big swings of the ocean temperatures in the uppermost 100 meters. I would say they can explain a lot why there are virtual "pauses" of the surface and tropospheric temperature trends w/o changing anything about the background global warming trend. "The oceans absorb more than 90% of the extra energy that's being built up in the system." I'm curious to know the mechanism by which the thermal energy enters the ocean, in your understanding. Also, where do you understand the surplus 10% 'extra' energy ends up and how? Here's a link to a section of an article I wrote recently on the subject of how the ocean warms, Richard. It has links to other sources. Below is a link to an graphic showing where energy goes. As for the "how", a detailed explanation would take more than could be adequately answered in a blog comment. I suggest you read up on the greenhouse effect. There are some links to good material near the top of this page. Back under your bridge, Richard, and take your faux curiosity with you. The answers to your questions are standard stuff, and you know it. Read the literature. If you're sincere, go and read Realclimate, or do some googling, then come back with a more specific question. Sou's got better things to do than to respond to your make-work questions. Kiwi global warming denier website? I had not seen that one before. Yes, I didn't twig at first. You can read about those clowns at HotTopic. They sued the NZ weather bureau and lost, of course. Then didn't cough up the court costs they should have paid, dumping them on the NZ taxpayers. Sou, I went to some trouble to explain myself in that comment. Please tell us why you have declined to publish it. I did publish it Richard. Since it contained rather odd ideas it was published in the HotWhoppery. Oh, well, thank you. You might like to reconsider giving the entirely false impression that results when you say: "This comment has been removed by a blog administrator" which sounds just like deletion and gives no hint that the comment's been moved to a 'HotWhoppery' (hilarious name). Please tell me: what are the odd ideas you mention? For one thing, you claimed "there is no evidence that the minuscule radiation from CO2 molecules might have a significant effect on the temperature of the ocean"
There is more than one thing wrong with that silly statement, not least of which is the huge increase in ocean heat content. What do you think it was? Tamino's leprechauns? Tedious Tisdale's goblins? The other of course is that CO2 radiation is not "miniscule". It is around 19% of all LW radiation absorbers in all sky, including clouds. An increase in CO2 has a marked effect, not a miniscule effect. I mentioned another at the HotWhoppery. You ought to be thankful I entertain any comment from you at all, given your history. Oh not that ocean "thermal skin" red herring/straw man thing again. It has been beaten to death elsewhere. Next! As usual, Richard Treadgold is merely here playing to the home crowd, of course. You call an obvious troll a troll and they respond "who, me?" It's all theatre. I hope they get paid well for selling their soul. Treadgold and cronies' responses to a 'Simon' stalwartly asking the obvious questions regarding ocean-atmosphere heat exchanges on that 'Hot Whopper wrong' thread are amusingly illustrative. You really could not make these people up! You have to be desperate to quote JoNova and Bob Tisdale as a source! What a strange little sheltered garden these people live in.